"When you board an airplane for a flight, do you ever consider what it is made of? "The materials in these machines are lightweight and durable, but not always environmentally friendly. Let's try to figure out whether that can be changed." Most modern planes are largely made of aluminium and carbon fibre or fibreglass composites that play an increasingly important role. There seems to be no obvious alternative to these materials for primary structures of aircrafts — but what about the so-called secondary structures or plane interiors that don't need to be as strong? Jens Bachmann, ECO-COMPASS project co-coordinator, says: "Let's have a look at some of the materials we're trying to replace with bio-sourced equivalents. They may be the ceiling panels, the side panels and the overhead bins. Today they're made of this kind of very lightweight "sandwiched" material with fibreglass surface — which we're hoping to replace with natural fibres from flax plants." Natural fibres are lighter than carbon fibres. They require less energy to produce, don't depend on non-renewables, and are better at noise dampening. Scientists in a European-Chinese research project are trying to use these advantages. They design eco-efficient composites based on flax fibres, recycled carbon fibres and bio-based resins. The recipes are modified to get closer to the required characteristics. "The most important quality we would like to improve in these materials is the flammability," Bachmann adds. "We also want to change mechanical characteristics by enhancing the adhesion between the fibres and the resin, and we're always trying to make sure the new materials are lighter than what we have now." At the INEGI Laboratory in Porto, Portugal, samples of newly produced bio-sourced materials are thoroughly studied to understand their behaviour in flight conditions. This test system shows the deformation field of a sample under tensile load. Based on this knowledge, researchers can simulate complex loading conditions of various plane elements in computer models before actually trying them on planes. "We need to know the limits of this material before using it in normal applications, because of course we need to be on the safe side," says Carmen Sguazzo, researcher in composite materials, at INEGI. Flammability is another big concern. Passenger safety requires that all interior materials are flame resistant. In this experiment, a new bio-sourced composite resists the flame, while cork - another bio-based material usable for composites - ignites. Natural fibres are very flammable, so researchers are looking for solutions. 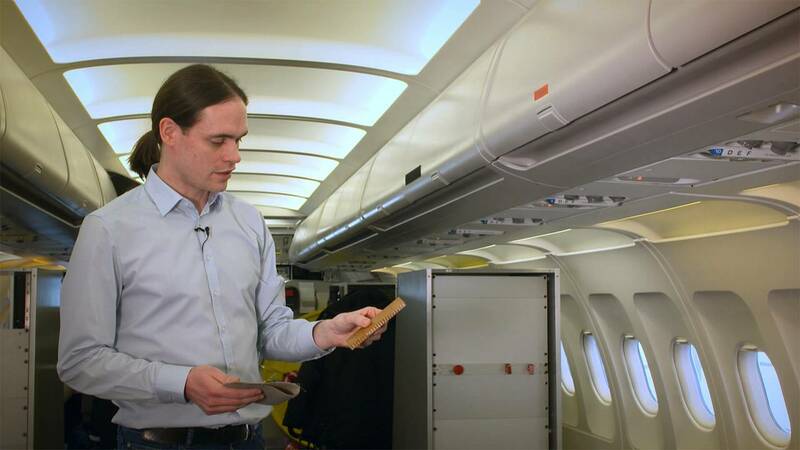 Says Jacques Cinquin, the senior expert in composite materials, at Airbus: "The main research activity we have done on these materials is fire resistance - how to modify and how to improve it. We put on surface protection, and add additives inside the resin so that it does not burn - that's the whole point of research work in this project." The project's Chinese partners are developing some bio-sourced composites that are then tested at European labs, in close cooperation with aircraft builders. "We cooperate with Airbus, for example, and also with the Chinese aviation industry to demonstrate the new bio-sourced materials," says Xiaosu Yi, ECO-COMPASS project co-coordinator, professor of material science engineering, at the AVIC composites centre. "This is a good combination: good for the environment, good for the resources, and good for application in aviation." Replacing all plane composites with something more eco-efficient may be a goal for a distant future. But modifying them to include some natural components in the mix might produce new competitive materials that could well take off in the decades to come.